P.S. Attached is a picture of the part, Game controller, for which I woul like to mold onto. I want to create a box with a perfect depresion to set the controller in. I have done something similar. I bought some PETG from McMaster-Carr. Then took some plywood, 2 pieces wit the same size hole through them. Bascially creating a clamp to hold the PETG sheet. Put a piece of PETG between the to pieces of plywood, looks like you created a window. Then take a heat gun and heat the PETG until it sacks a bit, then just take your controller and push it into the material a bit (however deep you want it). It will probably take a few trys to get it right. THEN if you want some kind of nice table stand or something, obviously you still have a lot more work to do to incorporate your PETG piece, plus maybe even making it more sturdy with some kind of support from behind, maybe fiber glass or expanding foam, or whatever. The appropriate tool for this is Tangent Surface. Go to the help files to get some tips on using this. 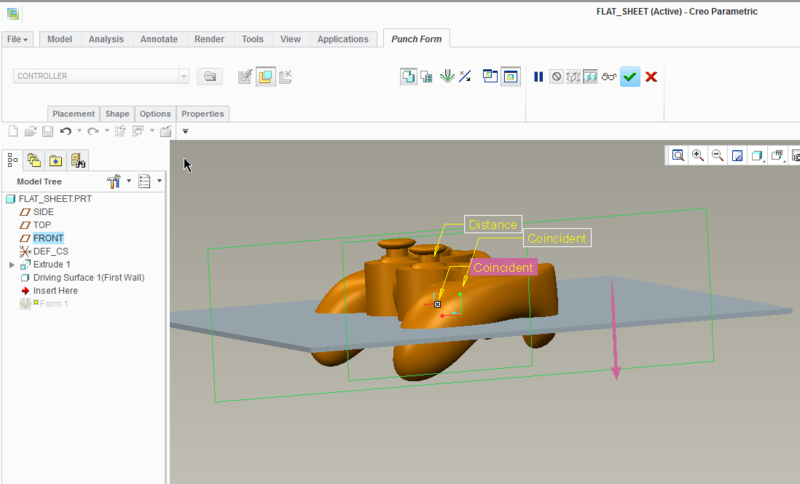 Attached is a full version Creo where this is done. I am assuming you know how to copy the exiting surface and how to set up the vacuum form plane. 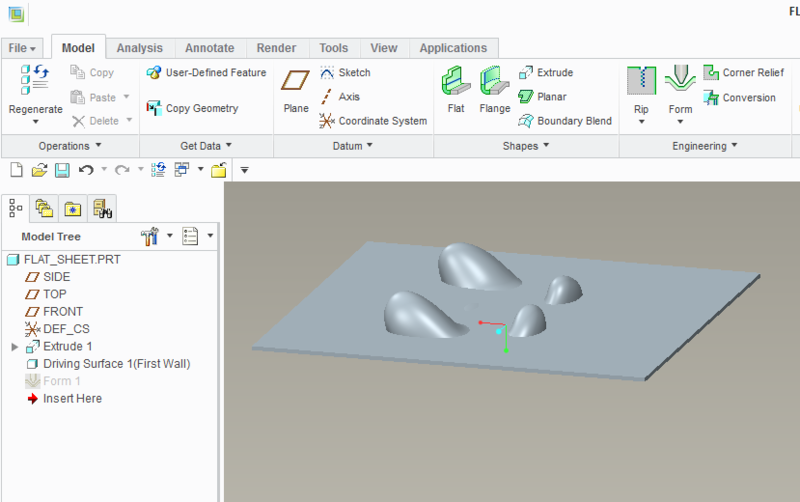 Determine the draft angle you want to give the case and build you tangent faces from the edge of your copied surfaces. The attached version is simply a connection between the tangent and a sketched boundary. And you might also try looking up "shrinkwrap"
There are a variety of methods to relate the mold part to the original part. Look for various Copy Geom methods. 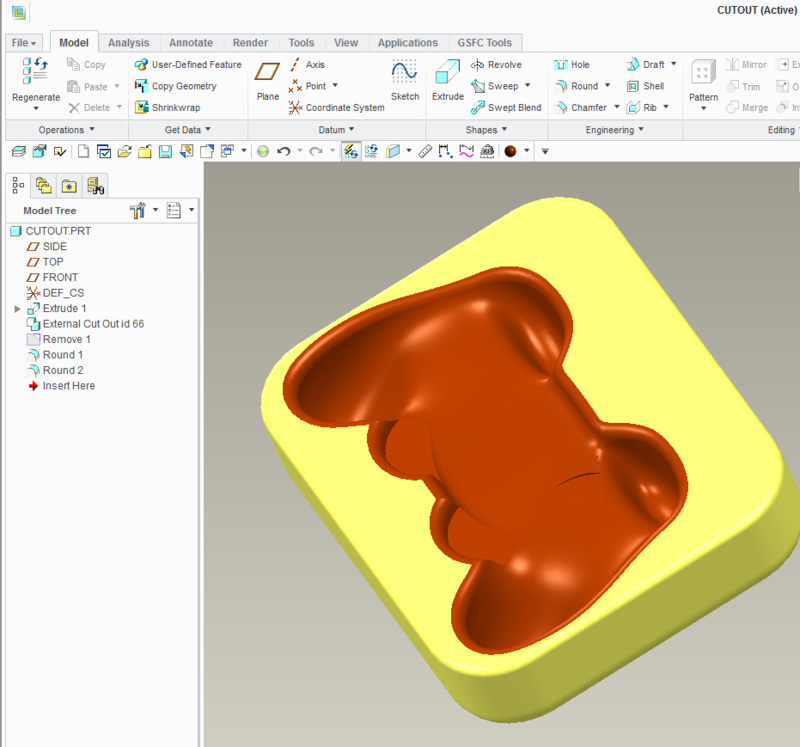 One thing the others have not touched on is to include a small offset from the copy of the original surface to provided enough clearance for variation in the vacuum-molded part and variation in the part that will be captured. There may be addtional clearance required if the mold from the back-side of the vacuum part to make up for the thickness of the plastic. To make a snug fit, select up to three small areas for bump outs to match the original part surface. 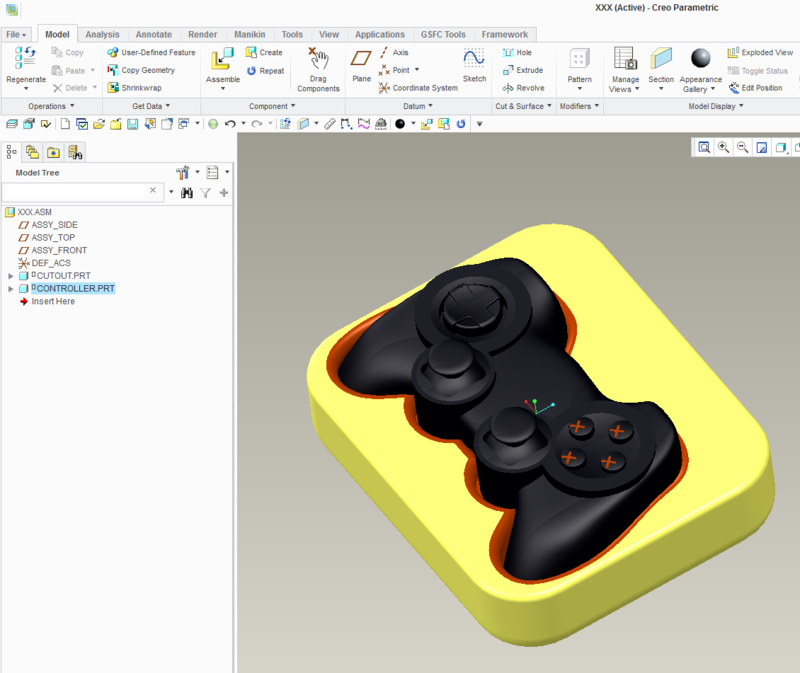 You could maybe also try to use sheetmetal and "punch form" the game-controller model into a sheet. There are various options of using only certain surfaces to do the punching. 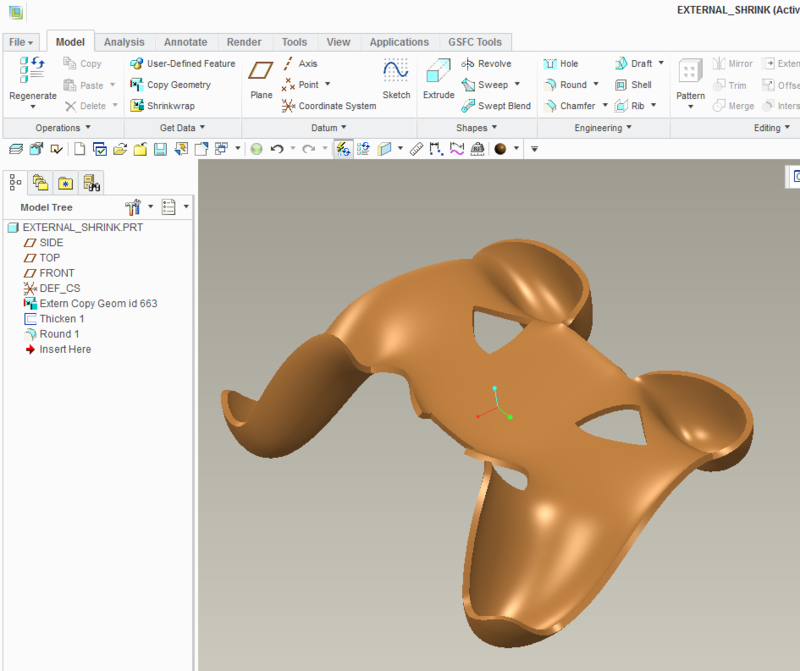 Also if you have the flexible modeling tools, that could work quite well to either a) clean up the above or b) prepare a copy of the game controller that's slightly "larger" and has the holes filled and use that for the punching. This gets tricky depending upon the geometry you're starting from. 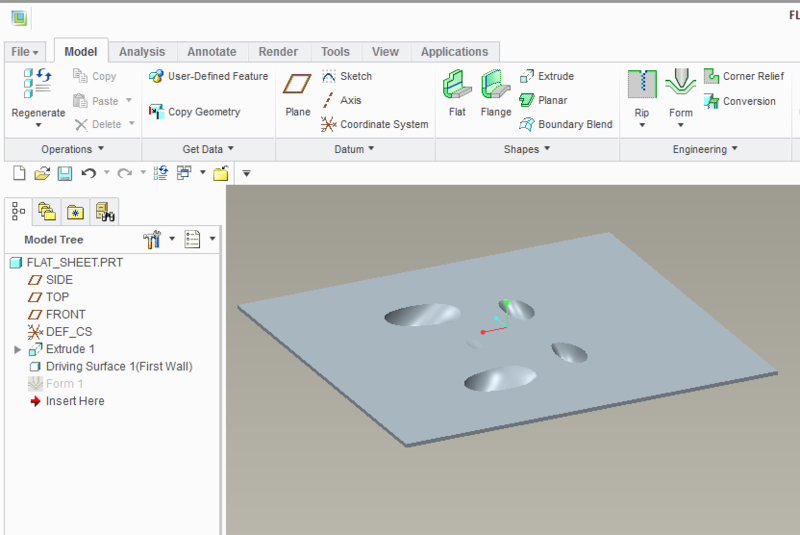 If your controller is clean and doesn't have crazy edges or angles, the sheet metal form feature can be quite deep. This should give a very close representation of a vacu-formed model. Anyway... just my $0.02... other people have also suggested some good techniques. Let us know how it works out for you!